I haven't seen fights this choreographed since the last time I watched 'West Side Story'! Before I even start the review, take a look at the movie poster directly to the left. Cuba Gooding Jr. is listed first, his familiar visage is larger and in the foreground. 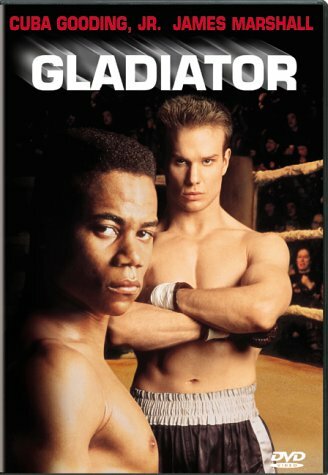 A first time viewer would pick up this DVD box and think this was a Cuba Gooding Jr. movie, right? The poster below was the original movie poster. No Cuba Gooding Jr. there. This was clearly a star vehicle for Mr. James Marshall. Who? Well, Mr. Marshall is probably most recognizable as the sweet but somewhat dim PFC Louden Downey from “A Few Good Men” (I can actually here the collective, “Oh yeah, that’s where I recognize him from.”). But, as you may already know, Mr. Gooding definitely made out the better of the two. I certainly can’t agree with some of his more recent role choices (“Snow Dogs” and “Boat Trip” jump immediately to mind and send shivers down my spine…), but he was undeniably charismatic in his Oscar-winning role of football player Rod Tidwell in “Jerry Maguire”, and very funny in his small part as the art dealer in “As Good As It Gets”. I have some reservations about his dramatic ability, but this isn’t the place to discuss that. But obviously Cuba’s post-Gladiator achievements came into play when repackaging the video and DVD version. You wouldn’t know it, but we’re here to talk about James Marshall’s turn in the sun as Tommy Riley in 1992’s Gladiator. Tommy Riley is the new kid in town, a white kid in what seems to be a predominantly African American and Hispanic inner city-type neighborhood (I don’t remember there being a specific city mentioned here, but it seemed to be a little too empty for NYC. There was snow on the ground, and Tommy was originally from Massachusetts, so I’m going to say somewhere in the Northeast.). 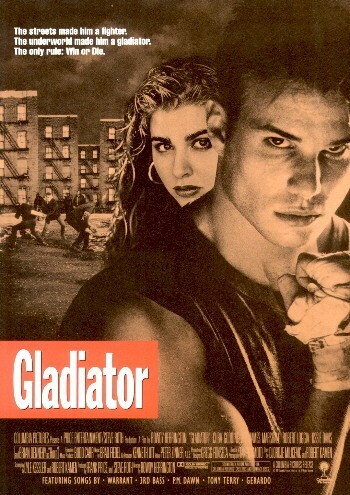 He immediately is at odds with one of the “gangs” in this ‘hood, and he’s just as immediately befriended by a familiar cast of characters; Dawn (Buono), the girl who takes an interest in Tommy for seemingly no other reason than the script tells her to; Romano (Jon Seda), the spunky Cuban kid (who actually walks around with a boombox blaring ‘Rico Suave’ at certain points) who has “dead meat” written all over him; and of course Abraham “Lincoln” Haines (Gooding), the one black kid that stands up for Tommy (also for no other reason than the script tells him to). The movie drops these 3 into the plot about as subtly as anvils. The final anvils, er, I mean characters step into frame after it’s revealed that Tommy’s dad has some gambling debts. Dad tells Tommy about the loan sharks after him, tells him that he’s got a job as a traveling salesman, tells him that he shouldn’t worry about the debts, and then leaves. Aside from a quick phone conversation with Tommy later in the film, Dad is never heard from again, and Tommy is now a high school kid living alone at home who now has to deal with Dad’s gambling debts on his own. The most direct answer to Tommy’s financial needs is provided by Mr. Horn (Dennehy), a shady businessman who runs an illegal boxing gym that puts on fights for a surprisingly large betting audience (how Tommy comes to Mr. Horn’s attention and vice-a-versa, I’ll get to later). Lincoln and Romano are also in need or want of Mr. Horn’s financial assistance, so they box at the illegal gym as well. Not surprisingly, the illegal gym comes equipped with a sage and friendly old cornerman (Davis), who spouts little chestnuts about boxing being a “mental game”, despite any evidence of this. And now we’re at what should be our main set piece. A half hour into this thing we finally come to our boxing ring, and hopefully any earlier faults will be brushed aside with some highly charged boxing action. 1) While the movie seems to be taking place in what was present-day 1992, the “gangs” are straight out of 1952. They don’t have guns. They settle things with their fists. Maybe a knife might come out, but that’s derided as a coward’s weapon. These street thugs may seem tough, but they’re quickly dispersed by anyone of even slight authority, including schoolteachers. If these guys were dropped into present-day Newark, they’d all be dead inside of 5 minutes. 2) Tommy is “discovered” by one of Horn’s “scouts”, Pappy Jack (Loggia), during a fight in an alley with some of the aforementioned gang members that just don’t like Tommy. Pappy glimpses one punch from Tommy from across a parking lot in the middle of the night and immediately “senses” that Tommy has “it”. 3) The development of Tommy’s relationships with Dawn, Romano, and Lincoln is handled in the most ridiculous way ever. There’s the initial introductions, Tommy’s first fight, and then they actually have a “Plot Advancement” montage! They show Tommy goofing around with Romano, doing a little boxing and training, winning some fights, holding hands with Dawn. And at the end, it’s just assumed that Romano is his tight bud (making his inevitable exit from the picture “mean something” to Tommy) and that Dawn and Tommy now have a relationship tantamount to marriage, where he’ll do anything for her. They actually give Lincoln some lines to establish his relationship with Tommy, but this 5 minute scene doesn’t cut it as an explanation for what becomes an undying bond between them. 4) It would be one thing if these quick, under-developed plot advancements were sandwiched between tons of action. . even highly choreographed action. . but the fights are just as short and pedantic. What we get for filler is a lot of moody walking scenes from Tommy. All of this adds up to a truly bizarre movie-watching experience. This picture is agonizingly slow moving in pace, but it moves too fast in it’s character development, so it has the effect of being boring AND confusing. You find yourself asking, “When did Tommy and Dawn fall in love”, and then just as quickly not caring. It’s not a pleasant experience. I really can't say enough about how ridiculous the boxing was in this movie. Aside from how staged everything looked in the fight scenes, there was almost no technical accuracy either. I realize that this is suppossed to be an "illegal" boxing gym, but the fighters are actually allowed to KICK a downed fighter IN THE FACE without disqualification? Why have refs at all?! Why even try to present it under the guise of boxing?! If continuing to punch and kick a prone fighter is met with nothing more than a restart of the count, why not just 86 the ref, lose the ring, give each combatant a club, and let them beat the snot out of each other!! And the sheer anarchy in the ring is being bet on! With posted odds, no less!! What are those odds based on?! How many knees to the groin the house thinks a guy can take? The only thing keeping this from a "1 count" is the fact that all of the actors were physically believable as boxers. Marshall and Gooding Jr. were in excellent shape, as were all of the challengers. And the topper to all of this? The movie's done with a completely straight face. There isn’t an ounce of camp or humor. It’s all played as a straight forward drama, to poor effect. And while a large part of this can be pinned to the script, the lion's share of the blame has to be placed on our star, James Marshall. I wish I could spread some of the blame around, but the camera is almost exclusively focused on Mr. Marshall. The man has 2 states of being; inert and agitated. The distinction between them is made with slightly heavier breathing and maybe some flared nostrils. When the occasion calls for a smile or some emotion, Marshall looks almost in pain. Not surprisingly, perhaps, is the fact that the only person who comes away from this movie making any impact on the audience is Cuba Gooding Jr. Not only does his persona and physical attributes make him believable as a boxer (I was really pulling for him as the lead in the "Ali" biopic, and I still hold hope that he'll play a boxer in something else), but he was able to project in his few scenes that immediate likeability that made him so popular in his future endeavors. He makes you want to be his friend, and that's why he's a star. Brian Dennehy, Ossie Davis, Robert Loggia, Carla Buono, Cuba Gooding Jr.